Members of Sorkbor Village Disaster Prevention Unit, Nonbok District Disaster Management Committee, and ADPC staff. Photo by Shoko Takemoto. 4:30 pm. 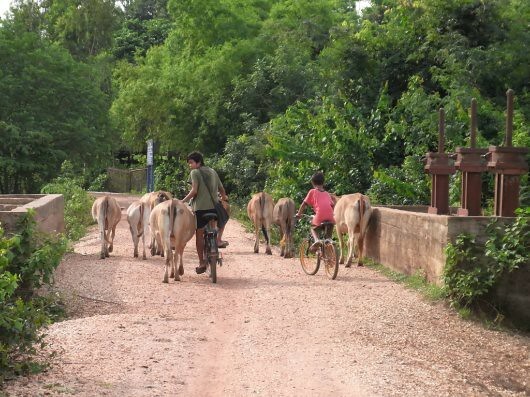 In the dusty streets of Nonbok District of Khammouane Province in Central Laos, it’s rush hour. This is a different kind of rush hour from the urban centers of Bangkok, filled with hundreds of cars cramped up and unable to move. As I try to rush back from my interviews with the small villages of Nonbok to my lodging in Thakhek, the capital of Khammouane Province, our hired van is immobilized by cows herded by boys on their bicycles and farmers on their diesel-run vehicles hurrying to their rice paddies to plant after the long-awaited rain last night. “There’s not enough water in the fields, but if you don’t plant now, it will be too late,” Ms. Somvath tells me with a sigh. Ms. Somvath is staff at the ADPC (Asian Disaster Preparedness Center) in Laos and my mentor for this trip. The rainy season in Khammouane Province has traditionally been from May to August. Farmers in the village have prepared their rice seedlings since May; more than two months have passed, and they are still waiting for a sign from the sky. Before coming to Khammouane, I was a little nervous to ask the villagers about climate change. For me, I have understood that climate change adaptation is about estimating the impacts of climate change using the best science, scenarios, and models available, and thinking about how one can avoid, mitigate, or prepare for these impacts as best as possible. Since my project’s main objective is to understand how communities perceive disaster risk reduction and climate change adaptation similarly or differently, I was worried about how to communicate such complex ideas to farmers and villagers who perhaps had very little knowledge of science or future projections. Boys herding cows by the water gate installed for water resource management. Photo by Shoko Takemoto. However, as soon as I started talking with the farmers and community members, I was stunned by their wealth of knowledge, experience, and insights regarding how seasonal weather patterns, extreme events, and frequency and scale of disasters are changing, how that is impacting their lives, and what needs to be done to solve these issues. Ninety-five percent of the people in Nonbok are rice farmers. Located between the Mekong River and the Xe Bang Fai River, they must survive through damages from flood and drought almost every year. For the villagers in Nonbok, adapting to climate change and reducing the risk of disaster is not a matter of science or predicting what might happen in the future; instead it is an issue that impacts their well-being and their everyday lives, and needs to be dealt today. Through the interviews and field visits I did in Laos, I began to understand that at the community level, the terms disaster risk reduction and climate change adaptation may be too limited to capture and address the villagers’ concerns. In vulnerable communities that already face several challenges, not only from natural disasters but also general issues of poverty, the cause of a disaster is complicated. It is difficult to isolate and identify whether a disaster is due to climate change or natural hazards. From the perspective of the communities, such differentiation seems irrelevant, if not confusing, because their main concern lies in reducing their vulnerability through enhancing their adaptive capacity to the various challenges that they face everyday. Nevertheless, through the process of planning and preparing for climate change and disaster, these concepts and categories are practical and perhaps inescapable. How can the complexity of the challenges and vulnerability at the community level be integrated into the planning framework for disaster and climate change? Shoko Takemoto is a Masters in City Planning student at the Department of Urban Studies and Planning at MIT, focusing on environmental policy and planning. Shoko is working in Bangkok this summer with the Asia Disaster Preparedness Center where she will examine the link between disaster risk reduction and climate change adaptation in communities in the Mekong River Basin in Southeast Asia. Her main interests include food sustainability, climate change, and community engagement, and she was also a member of the Cartagena Practicum. Your story highlights what a narrow view we have of who an “expert” is. This is particularly true in relation to climate change. As you point out, it’s indigenous people who are paying the closest attention to the weather, to the tides, to wildlife as they rely on the land for their survival. While much of the world muddles with politics and computer modeling, millions of people in generally marginalized communities are collecting important information on the planet’s transition to a new climate. Last winter I sat in on a lecture of Harvard’s Prof James McCarthy. He worked on an international project of the Arctic Council and the International Arctic Science Committee. They developed an in-depth report called the “Arctic Climate Impact Assessment” that had an entire chapter dedicated to indigenous perspectives as they quickly realized this small group of people had the most compelling information about the Arctic’s climate. Here is a link to the chapter which includes numerous quotes from the individuals who were interviewed, http://www.acia.uaf.edu/PDFs/ACIA_Science_Chapters_Final/ACIA_Ch03_Final.pdf. In the Arctic, elders were revered and relied on for being able to accurately predict the weather. But now they’re not able to predict it anymore. This small fact is more real, personal, and frightening to me than most of the things I’ve learned about climate change. It highlights the vital role that anthropologists and planners like you will play in educating the masses and effectively adapting to so much uncertainty. In response to your last question, I think that a good beginning would be for more of us to start listening to local experts and respecting the knowledge that they have. Shoko, I am wondering if you have any ideas on if or how the local knowledge you are learning about could be integrated into the academic & policy discussions on climate change? Do you see any challenges or barriers? From the impression that I’m getting from the field, there seems to be more sensitivity and acceptance of local knowledge for disaster issues because disaster response and relief efforts really depends on local capacities. On the other hand, for climate change, because of how so far has been a internationally-led top down approach, the definition for “experts” seem to be narrower. I just got back from Vietnam and was surprised by their sensitivity to the value of local knowledge and traditional knowledge. I’ll try to write a post on that soon! Shoko, I think your point about the larger context of community concerns is really interesting. For a community struggling with vulnerability on several fronts (and you don’t mention politics or larger cultural change, but I’m sure these are forces at play as well), discussions that deal only with the science of climate change must seem narrow. Planners have to think broadly about what a community is facing in order to address even one strand of issues effectively.